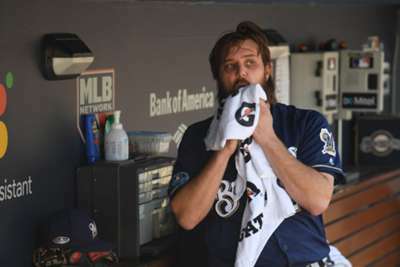 Milwaukee Brewers starting pitcher Wade Miley's day was very short against the Los Angeles Dodgers in the National League Championship Series on Wednesday. Miley walked left-handed hitting Cody Bellinger to start game five and was immediately removed by Brewers manager Craig Counsell midweek. The 2012 MLB All-Star was replaced by reliever Brandon Woodruff for the Brewers, who reportedly always planned to withdraw Miley early with the NLCS tied at 2-2. Milwaukee plan to stay Miley in game six, according to reports. The Dodgers started six right-handed hitters to oppose Miley in game five – Joc Pederson and Yasmani Grandal were left out of the line-up by Los Angeles manager Dave Roberts. Woodruff gave up one base runner after Miley was removed but escaped the inning without allowing a run. Miley is the second pitcher in postseason history to start a game and face one batter. Johnny Cueto also did so in game one of the 2012 NLDS.